Way was one of the artists who illustrated Modern Wonder in the late 1930s. The 1901 census shows he was born in 1890 into a dynasty of printers, artists and lithographers. His grandfather Thomas (1837-1915) and father Thomas Robert (1861-1913) were both heavily involved in working with the artist James McNeill Whistler. Both are featured in the Oxford Dictionary of National Biography. His father produced a series of lithographed advertising posters for the London Underground in the first decade of the twentieth century. Way’s work spanned more than forty years and ranged from illustrating children’s annuals to writing and illustrating technical books for children and adults. 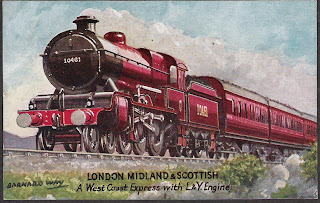 He specialised in transport themes, particularly railways. For a number of years he collaborated with Noel D. Green in producing practical and technical manuals published by Wells Gardner & Darton of London and latterly Redhill, Surrey. Way’s art ranged from pen and ink line drawings and sketches to coloured paintings and drawings. 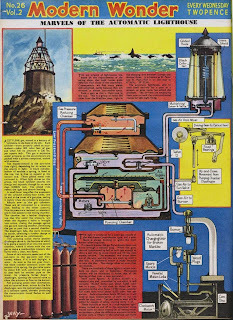 For illustrated technical books published by Odhams in the mid-1940s he made a series of cutaway drawings of machinery and industrial plant. These were all in grey monochrome, reflecting the printing restrictions of the time. He signed his work variously as R. B. W., R. B. Way and R. Barnard Way. 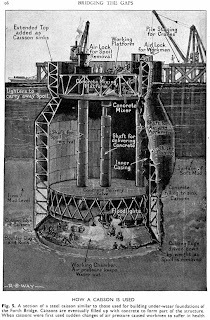 It is possible he might have done covers and other art work for the part works on railways, shipping, aircraft and engineering edited in the late 1930s by Clarence Winchester, as well as covers for Meccano Magazine but as these illustrations are unsigned there is no way of easily finding out. He draw at least one cover for The Listener or Radio Times. One of his railway paintings is in the collection of the railway museum at Swindon. Way was never featured as an artist for Eagle or Look and Learn, and it is possible he was largely retired by the time they appeared. Way’s biography is very obscure: he does not appear in modern academic studies of children’s books nor has he yet been traced in dictionaries of book illustrators. His date of death has not been found nor any details of his art school training. His concentration in his books on engineering and technical themes suggests he may have had some kind of technical training. Like many artists of his generation who were too old for active service in World War 2 he may have been engaged by the Ministry of Information or the Military in illustrating advertising or information booklets. The following list of his work has been compiled from the online British Library Catalogue, COPAC and WorldCat augmented by titles noted by book dealers in ABE. Many of the books went into several editions, but the earliest ones traced are the ones noted. It is certain that more references might be added, particularly for works he illustrated. Nister’s train book. London, Nister & Co, 1930. Motorland. London. Raphael Tuck, 1931. Every Boy’s Book of Electricity. London, Percival Marshall, & Co, 1933. Everybody's Book of Aeroplanes. London, Percival Marshall & Co, 1934. Worlds in the Making. London, The Chatterbox Company Ltd, 1934. By road, rail, sea and air. London, Raphael Tuck & Sons, 1934. The Romance of Progress. London, Wells Gardner & Darton, 1934. The Book of the Motor Car, with Noel D. Green. London, Wells Gardner & Darton, c.1935. How, Why and When? Railway Engines. London, Cassell, 1935. Modern heavy-oil engines simply explained. London, Percival Marshall, 1935. Famous British Trains A Chronicle of the Daily Work of the Named Expresses. London, R. Ivor Nicholson and Watson, 1936. How, Why and When? Aeroplanes. London, Cassell, 1936. Wireless Made Easy. London, F. Warne & Co., 1937. Mixed Traffic. London, R. Ivor Nicholson and Watson, 1937. The Book of Aeroplanes, with Noel D. Green. London, Wells Gardner & Darton, 1937. Ships, with Noel D. Green. London, Wells Gardner & Darton, 1937. Building with Steel, with Noel D. Green. London, Wells Gardner, Darton & Co., 1937. Electricity, with Noel D. Green. London, Wells, Gardner & Darton, 1937. The Prime Mover, with Noel D. Green. London, Wells, Gardner & Darton, 1937. Travel And Invention In The Modern World: A Book For The Young Of All Ages, ed. with W. S. Shears. Virtue & Co. [Virtue's Treasury of Knowledge series],1937. From Log to Liner. London, Sir Isaac Pitman & Sons Ltd. [The Science in Action Series], 1938. Time and It's Reckoning, with Noel D. Green. London, Wells Gardner, & Darton & Co., 1938. The Modern Workshop and Workshop Practice. London, Wells, Gardner & Co, 1939. Communications, wire and wireless. London, Wells, Gardner & Co., 1940. Welding and Flame Cutting, with Noel D. Green. London, Percival Marshall, 1940. My First Book of Trains. Edinburgh, T Nelson & Sons, 1941. My First Book of Aircraft. Edinburgh, T Nelson & Sons, 1941. Trains. Edinburgh, T. Nelson & Sons, 1941. Meet The Locomotive. London, Ian Allan for Transportation Press Ltd, 1945. Streamlined Trains. London, Findon Publications, 1945. Contractors' Plant and Machinery. London, Crosby, Lockwood & Son, 1946. How to make an Electric Clock. London, Percival Marshall & Co. Ltd., 1946. Engine Power, with Noel D. Green. Redhill, Surrey, Wells Gardner, Darton & Co., Ltd. [The modern how it works series], 1948. British Passenger Locomotives, with Reginald W. Wardale. Redhill,Surrey, Wells Gardner, Darton & Co. [A Quick Spotter Book], 1948. Rockets & Jets, with Noel D. Green. Redhill, Surrey, Wells Gardner, Darton & Co., 1949. Atomic Power. Redhill, Surrey, Wells Gardener Darton & Co Ltd, 1949. 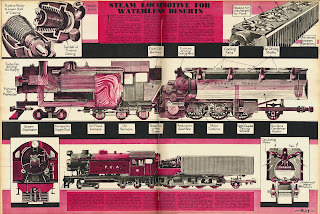 Freight & Mixed Traffic Locomotives, with Reginald W. Wardale. Redhill, Surrey, Wells Gardener Darton & Co Ltd [Quickspotter Series No.2], 1949. The Secondhand Car Owner, with Noel D. Green. Redhill, Surrey, Wells Gardner, Darton & Co., 1952. Woodworking at Home, with Noel D. Green. Redhill, Surrey, Wells, Gardner & Darton, 1952. Metalworking at Home, with Noel D. Green. Redhill, Surrey, Wells, Gardner & Darton, 1952. Electric Power, with Noel D. Green. Redhill Surrey, Wells Gardner Darton & Co., 1952. The Home Decorator, with Noel D. Green. Redhill, Surrey, Wells Gardner & Darton, 1952. 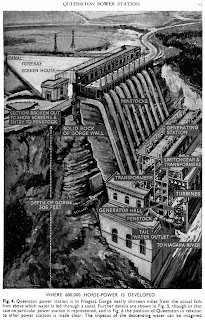 Water Power, with Noel D. Green. Redhill, Surrey, Wells, Garner, Darton & Co., 1952. The Story of British Locomotives. London, Methuen [Methuen Outlines], 1953. 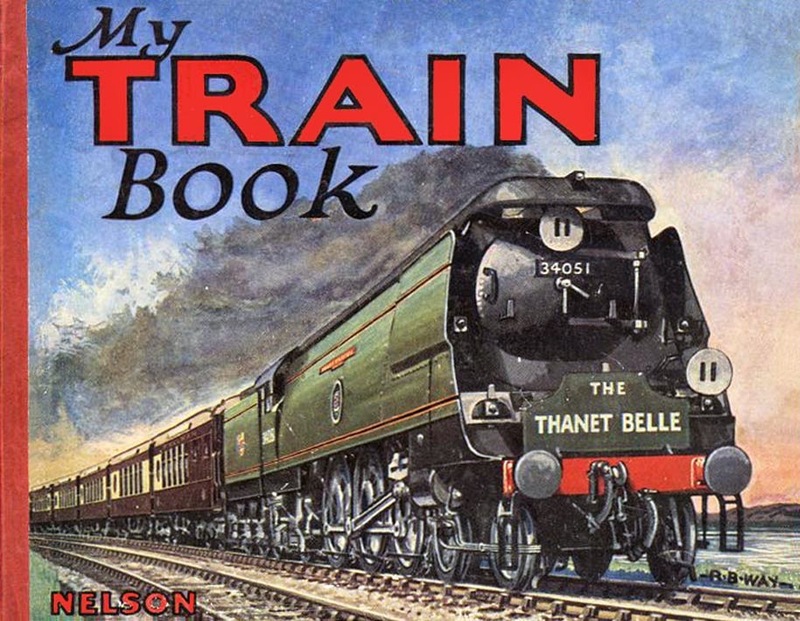 The Ian Allan Book of Trains. London, Ian Allan, 1958. My Train Book. London, Thomas Nelson & Sons (Little Hercules), 1958? The world's railways by G. Gibbard Jackson. London, Raphael Tuck, 1920. Motorboating for All : A Practical Handbook on the Construction by A. H. Linley Jones. London, Percival Marshall & Co, n.d. [c.1920/30's]. The World of Machines by Percy M. Baker. London, Wells Gardner & Darton, 1928. More Machines by Percy M. Baker. London, Wells Gardner & Darton. 1929. Still more machines by Percy M. Baker. London, Wells Gardner & Darton, 1930. The King. The Story and Splendour of British Monarchy by W. S. Shears; illus. with W. Lendon. London, Hutchinson, 1937. How to read workshop drawings by W. Longland. London, Percival Marshall, 1938. 1001 mechanical facts made easy by Percivala Marshall. London, Percival Marshall & Co 1940. The .303 Lewis Gun by G. Jacklin & D. Whipp. London, Nicholson & Watson [No. 2 in “Know Your Weapons” series] , 1941. Street and guerilla fighting by Derek Whipp. London, Nicholson and Watson [“Know Your Weapons” series no.4], 1942. Oil-Burning Locomotive by Richard James Eaton. London, Transportation Press 1947. This England by W. S. Shears; maps by RBW. London, Hutchinson, 1949. I drove the 'Cheltenham Flyer' by James William Street. London, Nicholson & Watson: London, 1951. Bridges by Leonora Fry. London, Methuen [Methuen’s Get to Know series], 1951. Factories and Workshops by Elin Walsh. London, Methuen & Co. 1952. 2750: Legend of a Locomotive by Harry Webster. London, Thomas Nelson & Sons, Ltd., 1953. Growth of Mechanical Power by Miles Tomalin. London, Methuen & Co, 1954. Railways for Britain by Patrick Thornhill. London, Methuen & Co. 1954. Boys' Book of the Air, ed. Eric Leyland & T. E. Scott-Chard, illus. with John T. Kenney. London, Edmund Ward Limited, 1957. Illustrated by R Barnard Way and John T Kenney . Fun with Radio by Gilbert Davey; illus with B. Gerry. London, Edmund Ward, Ltd 1957. Ship's Captain [Men of Action Series] by Eric Leyland. London, Edmund Ward Limited, Ltd, 1958. Mining Machinery and Transport by D. Le Jeune. London, Virtue and Co. Limited, 1959. [Coal mining series, editor E. Mason. Describes machinery associated with the mining and transport of coal]. Robert Barnard Way was born at Regents Park, London, on 16 July 1890, the son of Thomas Robert Way and his wife Amy Ellen (nee Cox). He married Gertrude Irene Potter at Linthorpe, Yorkshire, on 19 December 1917 and had three children before she died at Canterbury, Kent, on 16 January 1924. Way married again, to Minnie Isabel Pratten, on 12 September 1926 and had a further two children. He died at Hendon on 18 September 1958. Gordon Howsden, an authority on cigarette cards, has been in touch to say that R. Barnard Way illustrated and wrote the texts for a number of cards produced by Mardon Son & Hall, a printing firm based in Bristol. They produced the vast majority of the cards issued by the Imperial Tobacco Group, which included Churchman, Ogdens and Wills. Way worked entirely on railway themes. 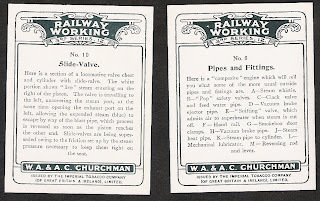 Way also produced three series of postcards on railway themes for Tucks and a series of adverts for G. D. Peters & Co. of Slough (supplier of railway equipment) that were published in Railway Gazette from 1948 onwards, and had letters published in Railway Gazette on 27 April 1951 and 25 May 1951 regarding the lettering BR was using at that time. His address was given as 3 Walden Road, Welwyn Garden City, Herts. Fascinating information about R B Way - many thanks. Do you know anything about P B Hickling who illustrated the 10 books in the Ladybird Animal Series (No 497) which were issued during the 50's. They were all written by Noel Barr and many consider them to be the finest series of Ladybird Books ever produced. They have a uniformity due to the same author and illustrator and the early editions which have dustwrappers, a pasted on colour picture on the front board and attractive pen and ink endpapers are really attractive. Thanks for the link about P B Hickling - I've wondered about him for years. The final book in the Ladybird series was The bSleepy Water Vole which was published in 1955 - 4 years after his death.So he saw very few of the series in print. Did you ever track down any information about the author of the books? Noel Barr wrote all 10 of the series and The Wise Robin was presumably so successful that Ladybird brought out a new edition in 1988 by David Hately entitied The Christmas Robin. Although the title page states that it is adapted from The Wise Robin by Noel Barr, there is no mention of P B Hickling due to entirely new illustrations. A minor update about Way's engineering background since I wrote the above. An advertisement I have seen for Percy M. Baker, *More Machines*, London, Wells Gardner & Darton, 1929 says "The book is profusely and very clearly Barnard R Way [sic], himself a well-known and eminent engineer." Wow, Robert Barnard Way was my Great Grandfather, I have learned so much about his work from reading this ! I have recently discovered that Robert Barnard Way married the daughter of my 2nd great uncle. He is on her death certificate 1933 as a commercial artist. Would i be able to contact you re. Family History? I have recently discovered that Robert Barnard Way married the daughter of my 2nd great uncle. He is on her death certificate as a commercial artist. My mistake. Her death year was 1924. Dear sir,I have an'Original Illustration'by R.B.WAY as described by the gallery from which I purchased the painting of the cover of TRAINS by Nelson,1951 Edition.It is an AI 'Burgie'60120 Yorkshire Pullman.The painting is a water colour,the engine is called Kittiwake.I would be grateful for any input from you or your knowledgeable subscribers as to whether or not the information I was given is true and if so is it a valuable item.I am not sure how to scan or photo the painting to give you 'visual verification' but I will do so if you need this to give an opinion. My mom just picked up "Trains" at an antique shop. I am decorating my son's room in trains and she thought I'd like to use the pages by framing them. They are very detailed and vintage. Although, I hesitate to destroy the book in order to frame the pages. Is this something I should hang on to? For what it's worth, the book itself is in poor condition. It's obvious someone has attempted to re-inforce the spine and a child has scribbled throughout the book. Any suggestions? I've just done one of my late father's jigsaw puzzles, it is of Tower Bridge and is signed Barnard Way. I'm guessing this is the same artist. the paintings were purchased. They are for sale, l will not put them up for sale until such time as we have made contact, within reason. I have three wonderful watercolours of vintage bus's painted by your G Grandfather,l was about to put them up for sale when l stumbled across this site and only think it fair if the family see them first.l have forwarded photo's to Steve on this site. I will wait a reasonable amount of time for your reply. Hi Bill, I have emailed you. I have a complete, but 'frayed round the edges' copy of TRAINS. Typical thick card pages, with a total of 14 illustrations, including the covers. There is no date. It has to be 1950 to 1952 by the inclusion of a 'Britannia' class loco with the older style 'cycling lion' British Railways crest. I am quite happy to part with it if you are interested. 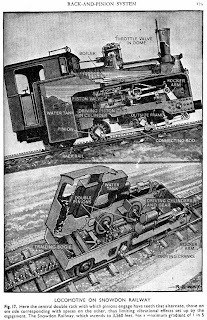 I remember seeing Way's cutaway illustrations in at least two books that I enjoyed, both by Odhams Press round about 1950: Railways, Ships and Aeroplanes and the later Railways, Motor Cars, Ships and Aeroplanes. I was always amazed by the way he kept things to scale while still retaining all the functional details. I am very curious about Robert B Way and being your grandfather - would you be related in some way the the Way family that lived in Burrough Green Nr Newmarket.A Robert Way lived there, he was abook collector as far as I recall, he had a son called Greg , who carried on his business after his father died in the 1960's. The way family were friends to my parents, being catholics they attended the local church together, Ways daughters were also close childhood friends of two of my sisters also. Is it possible that the Robert Way of Burrough Green was the son of you granfather? I have an online image of a vintage Croydon Airport jigsaw, source now unremembered, illustrated by Barnard Way. Can I send a copy to anyone?